PAANCHTHAR, June 22: The government has started collecting the details of citizens for the distribution of digitalized National Identity Cards (NIC), for the first time in history. Digitalization of citizen's details is one of the most ambitious projects of the country. After creating much buzz, the project kicked off on Tuesday with the officials from the federal and local governments in the district of Panchthar collecting the personal and biometric details of citizens. "We have started collecting the details for the distribution of NIC. We begun the work from Phidim Rural Municipality," said Shivaraj Joshi, director of National Identity Cards Management Center, adding, "We will be heading toward other rural municipalities soon." He informed that the cards will be distributed after completion of collecting the details. Currently, preparations are underway for the development of processing center and also for bringing cards. Citizens have been flocking in four different centers set up in Phidim for furnishing the details. So far, 372 people have filled their details. According to the officials, it takes 15 to 20 minutes to collect the details of an individual. A total of 20 computer operators and officials have been deployed for verification. Citizens have to fill their personal details, give biometrics of all ten fingers, click photo and take a receipt from the collection center. The government had announced to provide NIC to 110,000 locals of Panchthar and 7,000 officials of 'Singha Durbar' in the first phase of this project. This card can be read online just like most of the other smart cards. Government was planning for this project since the fiscal year 2009/10 but it announced to distribute NIC in 15 districts of the country during the recent budget speech. This card can be used for multiple purposes. All individuals will have distinctive card number. Citizens above 16 years of age and with citizenship can have this card. This project has been carried out with loan from the Asian Development Bank (ADB). In the first phase, the ADB will be providing a loan of USD 4.8 million for the project. Safran IDT of France has been awarded the contract for the project. 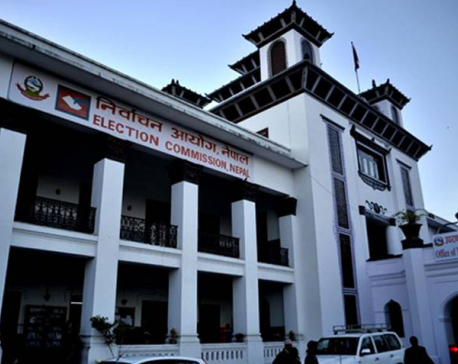 Cards will be distributed as per the details of voter list of the Election Commission. Locals are actively participating for the project, informed Tulasi Dahal, one of the officials of the center. Though the project has kicked off, some of the locals are still unaware about it. This is due to lack of promotion from the center. In fact, the center has failed to make people aware about the importance of such cards. Caption: Details being collected in Phidim-4, Panchthar for the distribution of National Identity Cards.